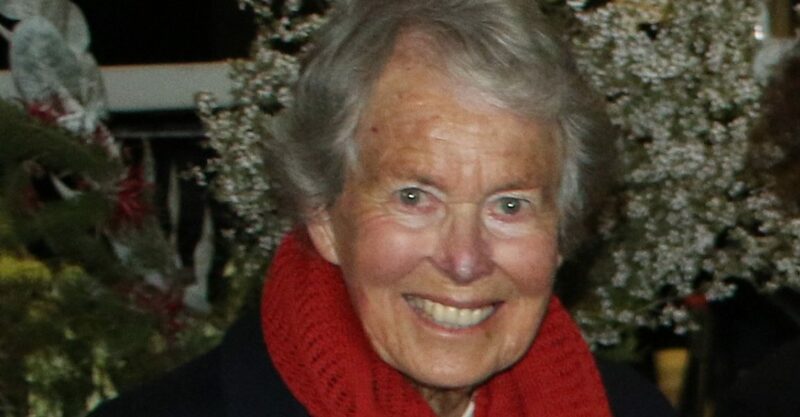 Sad news in the catchment as Alison Doley, a long time supporter of the Moore Catchment Council, passed away on 20th February 2019. 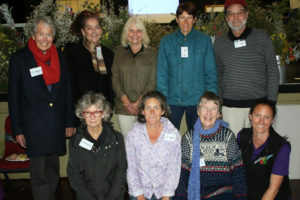 Alison farmed at “Koobabbie”, Coorow and was a long term champion of landcare and native ecology especially with her love of Carnaby’s Black Cockatoos. A timeline of conservation events at Koobabbie is attached. 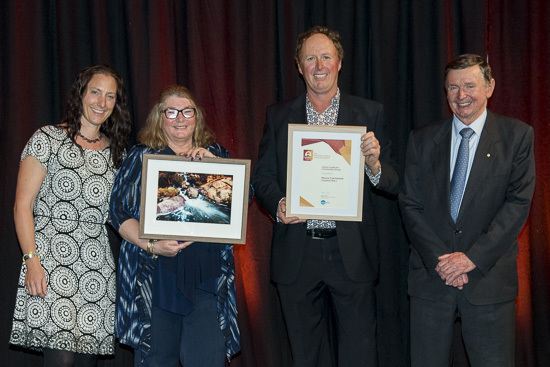 Alison was honoured in 2017 with a AM in the Australia Day Honours for significant service to conservation and the environment in Western Australia through revegetation and catchment recovery initiatives. Around 165ha of the property was revegetated with local provenance native species between 2007 and 2011. Much of the bush is protected under covenants. 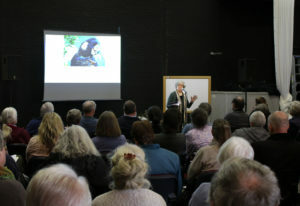 She was also a member, founding member and president to several conservation and recovery committees, trusts and panels. 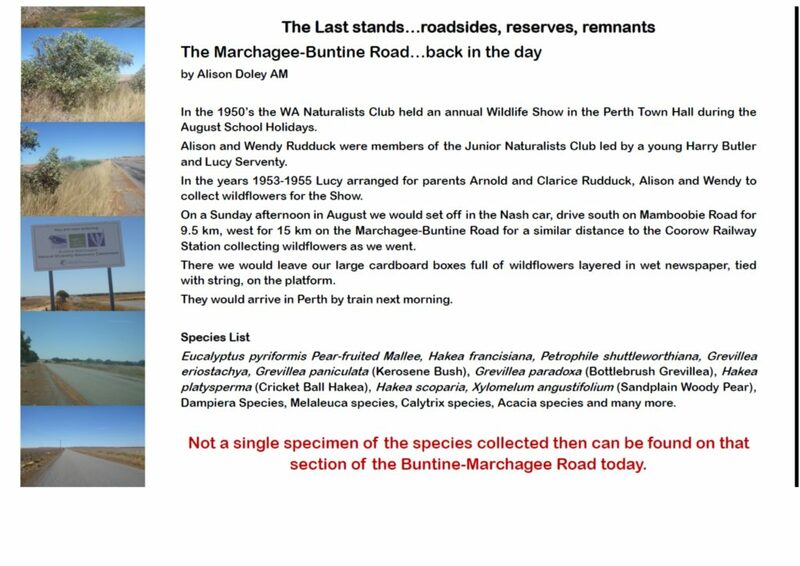 Last year, Alison was an integral part of The Last Stand organising committee which helped raise awareness of native biodiversity in the Midwest wheatbelt. We’d meet every month for 6 months plotting how we were going to make the event work. 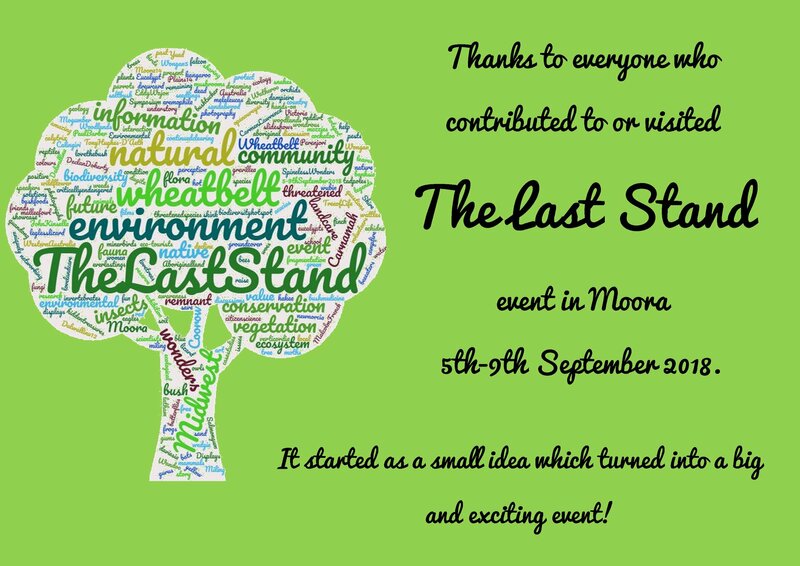 People from all over Australia flooded to Moora between the 5th and 9th September to visit The Last Stand, a free environmental awareness event aiming to highlight the wonders and woes of Midwest wheatbelt native vegetation. 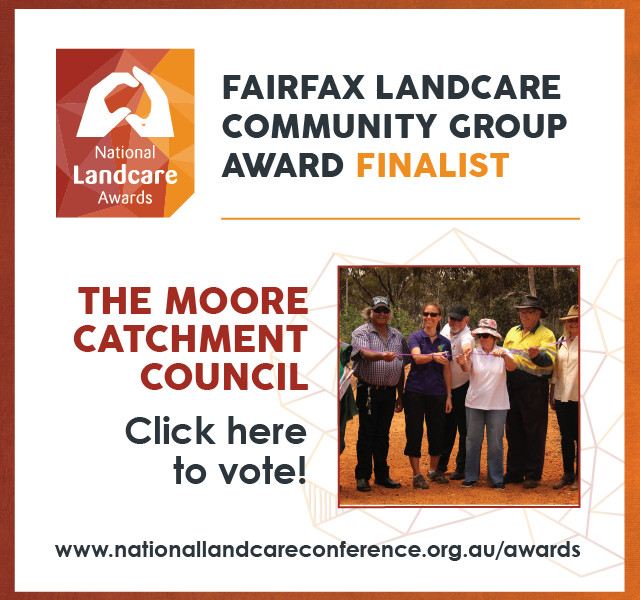 Vote for the Moore Catchment Council to win the People’s Choice Award at the National Landcare Conference in October 2018. All finalists are in the running to win the People’s Choice Award. A highly-coveted prize, this award is presented to the finalist who receives the most votes from the general public in the lead-up to the awards. The winner will be announced on Thursday, 11 October at the Awards gala dinner. Voting is now open and closes on Wednesday, 10 October 2018. Show your fellow Landcarers some love and vote for them to win the People’s Choice Award. Up until 30 July 2018 Landcare Australia are giving you the chance to win one of eight 2-day passes to the Conference and the Awards gala dinner. One lucky entrant per state will win so get your votes in. Voting is now open and closes on Wednesday, 10 October 2018. 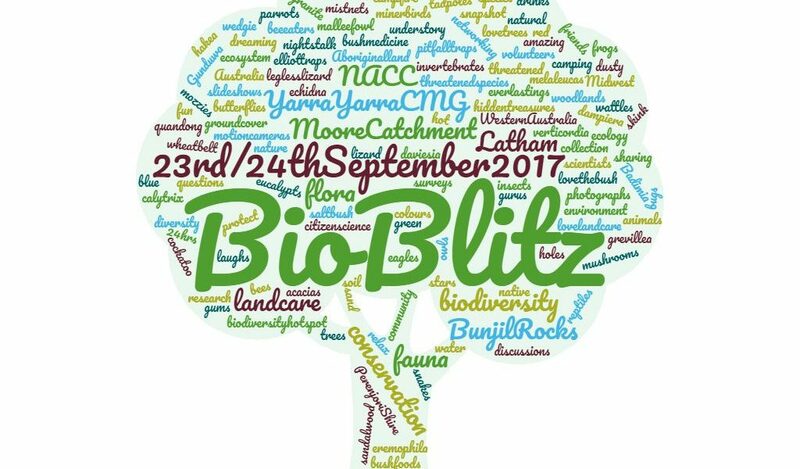 Northern Agricultural Catchments Council, Yarra Yarra Catchment Management Group and Moore Catchment Council were proud to co-host the 2017 Bunjil Rock BioBlitz 23rd & 24th September 2017. A BioBlitz is a 24-hour event involving rapid collection of data about the biological diversity of a particular site; enabling scientists and other experts to identify as many plant and animal species as can be found in this limited time frame. It doesn’t provide a complete inventory of species, but rather a ‘snapshot’ of the species that occur in the area. 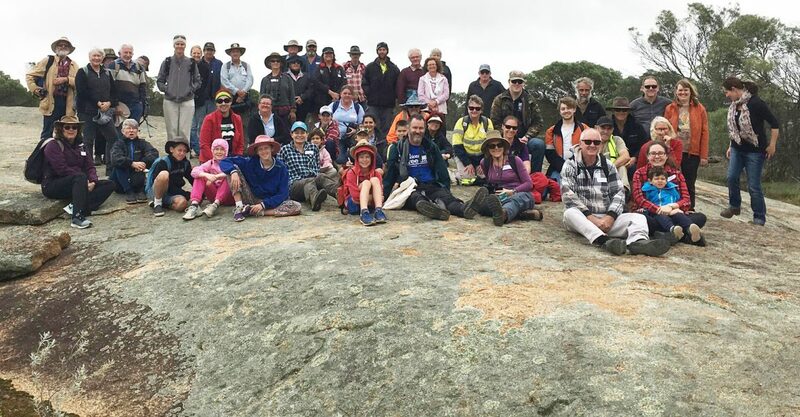 A BioBlitz is a collaborative process, which brings together scientists, skilled amateurs, willing workers and interested ‘others’, with members of the local community, all working together to expand knowledge about the biodiversity of a particular location. 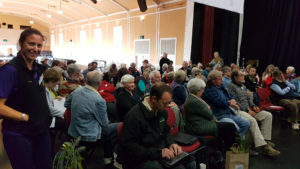 Professional biologists and capable amateurs from the local area, Perth and throughout the Southwest – lent their expertise to the finding and identifying of taxa within their respective field. This project is supported by Northern Agricultural Catchments Council, Yarra Yarra Catchment Management Group and Moore Catchment Council , through funding from the Australian Government’s National Landcare Programme and Gunduwa Regional Conservation Association. Moore Catchment Council is celebrating triple funding success!! Recent announcements from the State NRM Program and the National Landcare Program (NLP) have seen MCC attract $185,000 to the catchment. 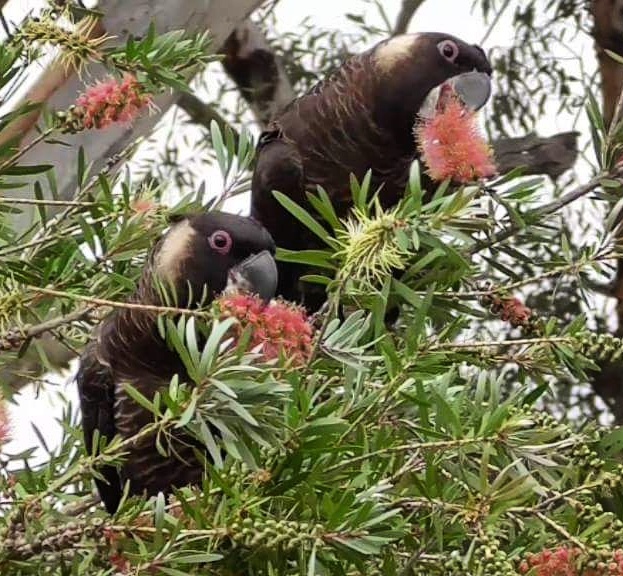 $100,000 from the NLP’s 20 Million Trees program will see 50ha of native habitat, featuring priority tree and shrub species suitable for Carnaby’s Black Cockatoo, planted on five local farms. 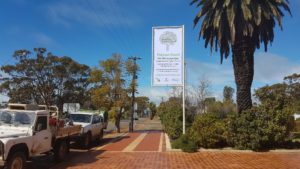 This is the 3rd 20 Million Trees project MCC has been successful in obtaining funds for, and with only 64 projects funded Australia wide(only 10 in WA), MCC are extremely grateful to have been selected again. $85,000 will come from the State NRM Program to continue protecting and enhancing the Moore’s natural assets including fencing remnant bush and revegetating degraded land. Part of this program will be the engage the local Yued community through providing paid work opportunities working on country, and work with two schools providing learning experiences through Noongar and native wildlife education. This funding news is excellent news for the continuation of important landcare projects in the Moore catchment. The extra funding also allows Moore Catchment Council to continue its work past 2018. Can extra money be made from planting native trees and shrubs on your farm? 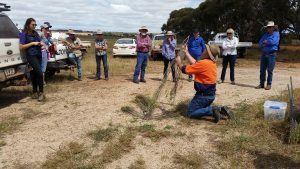 This was one of the questions aimed to be answered from a recent field walk at Gabalong, east of Moora, looking at sustainable agriculture options which have both landcare and industry outcomes. The field walk, held 26th October at Les Crane’s property, was a final part of a Moore Catchment Council project reviewing sustainable agricultural projects carried out over the past 10 years in the Moore and Yarra regions. 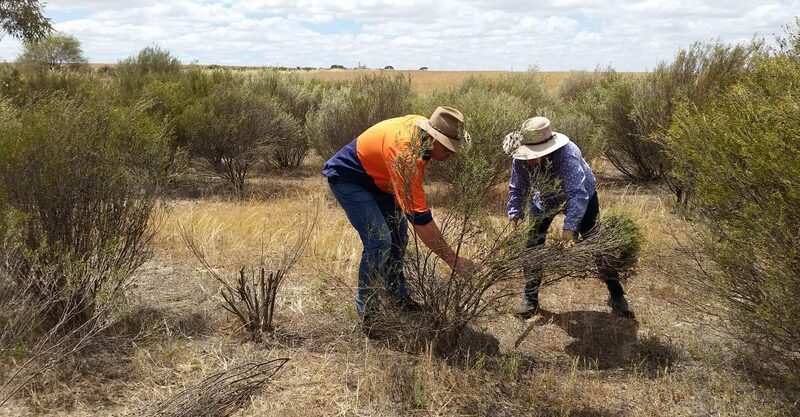 Projects have included brushwood, oil mallee and native tree plantations, saltbush and fodder shrubs, and perennial pastures. The project aimed to find out what worked, what didn’t work, improvements and recommendations for future projects. 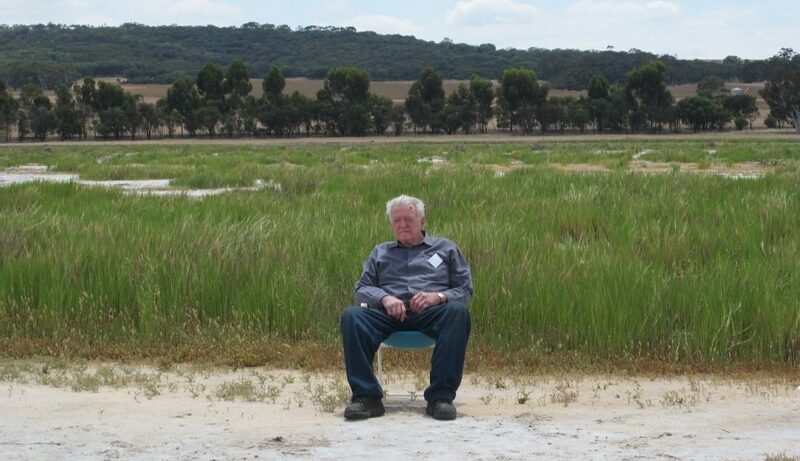 John Longman’s footprint can be seen in a majority of the landcare initiatives that have happened in the Moore Catchment especially around Gillingarra. John was chair of the Koojan-Gillingarra Land Conservation District Committee (LCDC) for many years and has served on and off of the MCC committee since its conception. John was also on the Committee of the West Midlands Group in its early years, a member of the Dandaragan Shire LCDC and a member of the Northern Agricultural Catchments Council (NACC) board. John has helped get many salinity projects & water projects happening and always had a knack of getting pollies up from Perth to see (and fund) the issues. Thanks John for all your perseverance and making plenty of noise. You have made a difference! And we will miss your dedication and squeaky wheel getting things done. … a resident, land owner or land manager of the Moore River Catchment in the Shires of Dandaragan, Gingin, Moora, Victoria Plains, Perenjori, Coorow, Carnamah or Dalwallinu? … have links to the community ? 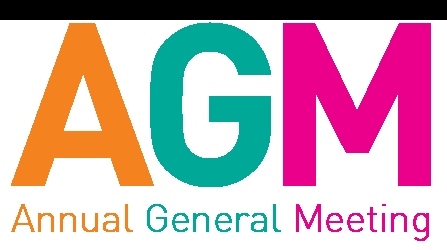 Come along and see what is happening in your area with regard to NRM.